Last week we told you about getting free Free Kiwee Content. Well, as part of this promotion, Muggins are also free! So go ahead and create as many Muggins as you wish while they're still free! Click here to get a free Kiwee Muggin. News: Free MSN Icons to celebrate Messenger's birthday! The world's most popular IM client, MSN Messenger (and Windows Live Messenger), will turn 7 years old this coming Saturday! To help celebrate this huge milestone, two of Messenger's content partners are providing Messenger users with free content packs (Dynamic Display Pictures, Free MSN Icons, Emoticons and MSN Backgrounds!). We'll be adding more free Messenger content very shortly. CE/DP Stealer, the original MSN Messenger content stealer is back! With the CE/DP Stealer, you can steal Emoticons, Display Pictures and more from your contacts on MSN Messenger 6/7. CE/DP Stealer 3.0 introduces complete MSN Messenger 7 support, support for previewing all image types and plenty of improvements throughout the software! For more details and information visit the CE/DP Stealer 3 section. Download CE/DP Stealer and start robbing your MSN Messenger contacts! The Custom Emoticon/Display Picture Backup Wizard is a utility for backing up the custom content, like MSN Display Pictures and MSN Emoticons, that you have added to your MSN Messenger account (MSN 6.2, 7.0 or 7.5). This is useful if you have a lot of emoticons and display pics and can't afford to lose them, have lost the original files, need to re-use the files on another account. If you previously lost your files, MSN Messenger doesn't always delete them so you may be able to recover some images as well. This utility is for anyone that uses a large amount of custom content in MSN Messenger and cant afford to lose them. Currently supports backup for MSN Emoticons, Backgrounds and MSN Display Pictures. Compatible with MSN Messenger 6 and 7. + Click here for a large screenshot. Visit the backup wizard page for the latest version and information. No major changes are present here, most of the old tools are working including the CE/DP Stealer. You can also get your hands on the thousands of free MSN emoticons and Display Pics available here to have some extra fun with MSN 6.2! Visit the MSN EMOTICONS sections for thousands more! Visit the MSN DISPLAY PICTURES for free MSN display picture packs. Emoinstaller, the software that automatically installs MSN emoticons along with proper custom emoticon shortcuts has just released 3 new MSN custom emoticon packs/sets. These packs include Classic Green MSN emoticons, an exclusive new emoticon pack called E-Skimo by Josh and another new exclusive pack called Fusion by new kid on the block Nemuis. Download these awesome new MSN emoticon packs right here by clicking on the previews below! 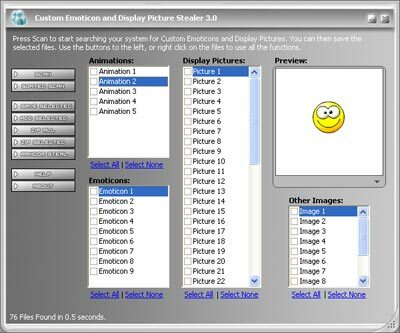 These new packs bring up the number of Emoinstaller MSN emoticons packs released to 15 MSN Custom emoticons packs. If you missed out on the other MSN emoticon packs, visit the Emoinstaller website for more automatically installing MSN emoticons! Emoinstaller is a brand new product created in a joint venture between this site and ItsElephants. This amazing software installs custom emoticon packs into MSN Messenger AUTOMATICALLY with proper shortcuts in around 30 seconds with a few clicks. Download these emoticon installers NOW! Utility for swiftly adding and removing your display pics. Add/Remove 100's of your MSN 6 Display Pictures in seconds. Utility for backing up your MSN Messenger 6 Custom emoticons/Display pictures/Backgrounds and restoring them later. Great utility if you mess around with your emoticons, now you don't have to worry about losing them! Display picture pack by DeViL. 23 beautifully crafted display pics. 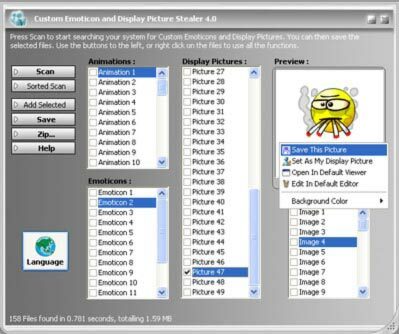 Custom Emoticons set based on Windows XP. New Display Picture and Custom emoticon packs have been added. And finally, another great emoticon pack, containing 150+ marvelous emoticons by iE. Don't forget, you can import all these beautiful Emoticons and Display Pics into messenger in a matter of minutes using the CE/DP Manager . Custom Emoticon and Display Picture Stealer version 1.4 is now released ! New algorithm - Faster than ever before! So what are you waiting for? Download it right here ! Visit the Forums for help/bug reports. News: CE/DP Manager Now Online ! CE Importer to add many emoticons quickly and automatically - Great for importing custom emoticon packs. DP Importer to add many display pictures swiftly - Very handy for importing Display Picture packs. CE Dispatcher for sending all your emoticons to someone. Great for sharing your custom emoticons. What are you waiting for ? Download it right HERE or from the download section! For help/bug reports etc visit the forums. The site has been updated with some cool new content. An MSN 6 Hooking example, 2 Font Packs, a VBScript reference and a few other files. And also added some games to play ! Browser related Emoticons and Display Pics. Created by Sherv. This file includes the following packs : Mario emoticons, Pacman emoticons, SARS Protected emoticons, Extended emoticons and the Rock, Paper, Scissor game emoticons. This file includes the following emoticon packs : Aliens, Numbers, ICQ, Black and White. This pack contains the emoticons from some great forums : phpBB, Invision Power Board, Vbulletin and Snitz. Use these to indicate your status in your away messages and to refer to any status while chatting. Get them now from the Download section! V 1.3B of CE/DP Stealer is now online ! This version includes bug fixes and boasts some new features ! These include integration into messenger , Manual renaming of files, right-click menu in file list and A DUTCH VERSION ! The 'OUT OF MEMORY' error should also be fixed. Grab 1.3B from the downloads section now ! Make sure you report all bugs and mistakes either to me or at the forums.